In Thailand, there’s an expression about happiness that can pose a challenge on a college campus. “In Thailand, this is true, people consider excessive thinking a sign of mental illness, which would make most college campuses pretty much an insane asylum,” he said, prompting laughter from the crowd of students, faculty and staff in Lee Chapel on Tuesday morning. Eric Weiner gives the keynote address on Values Day, Sept. 25, 2018, in Lee Chapel. Weiner’s book was selected as this year’s read for Values Day, an annual tradition at Stetson. Classes are canceled and offices close to allow the community to focus on the university’s core values of personal growth, intellectual development and global citizenship at workshops, community projects and other events. “I have to tell you this is my tenth Values Day, and I have never seen the room this full before,” Stetson President Wendy B. Libby, Ph.D., said in welcoming the crowd to Lee Chapel. Weiner, a former foreign correspondent for National Public Radio and former reporter for the New York Times, spoke for an hour and then attended the Stetson R.E.A.D., where participants discussed his book and asked him questions. The event was booked to capacity, and organizers have scheduled another Q&A with Weiner on Wednesday, Sept. 26, from 1:15-2:15 pm. in the Sage Science Center, room 222. Cultural Credit will be available for students and Rajni Shankar-Brown, Ph.D., associate professor and Jessie Ball duPont Chair of Social Justice Education, will facilitate the discussion. 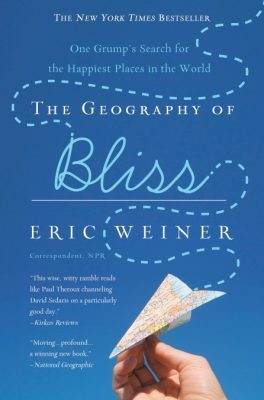 A self-described grump and malcontent, Weiner traveled the world for “The Geography of Bliss,” and gave an overview Tuesday of what he gleaned from some of the happiest places, including Switzerland, Iceland, Bhutan and Thailand. The search for happiness often is based on myths, he said. People believe wealth brings happiness when, in fact, money buys happiness only up to a point. “The U.S. is five times larger on a GDP (Gross Domestic Product) basis than it was in the 1950s but no happier,” he said. Instead, he encouraged the crowd to pursue a meaningful life – what he called “the flourishing life,” one built on close relationships, selflessness, virtue, patience, creativity and trust. And humor helps, too. “Simple, obvious, but true,” he explained. “We don’t often think about what we honor and today on Values Day, I would challenge you, when you leave here and you go to lunch and you go about your day, I challenge you to think about what it is that you honor,” not just in words, but in thoughts and actions, he said. 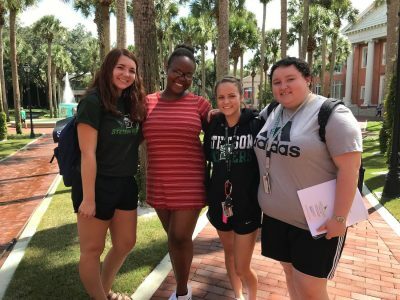 First-year students, from left, Kellie Baier, Johnisha Wright, Lexi McComb and Stephanie D’Addio, enjoyed the keynote address and were heading to an exhibit at the Hand Art Center on Values Day. “Once you’re clear on that … it’s almost something magical about what happens in your life. Things will happen for you, things line up. It’s a mysterious process, and it is, I think, pure genius,” he added. His message of happiness and flourishing resonated with first-year students and friends, Lexi McComb, Kellie Baier, Johnisha Wright and Stephanie D’Addio.